After last week’s rather slow news period, this week was definitely more active, albeit with some pretty terrible stories. As I do every Friday, here’s the big headlines from the past week. Last week I made the conscious choice to not talk about the Zoe Quinn story mainly because at the time I thought it was a private issue that some jaded ex-boyfriend decided to put out on the Internet. Over the last week though, it’s become very clear that there is a very vocal portion of certain areas of the web that have trouble dealing with the fact that games have become a major entertainment media – they are made for everyone, and are marketed for everyone. Those people have taken it upon themselves to spew hatred and vile directed at anyone that they don’t consider true “gamers,” which unfortunately over the last couple weeks has been almost exclusively women. It’s embarrassing to the wider gaming community, not to mention an embarrassment to general humanity – these people disgust me and the comments that I’ve seen infuriate me to no end. The second part that has bothered me is the vitriol I’ve seen directed at the people that have been calling attention to this issue. The people that are saying it’s just “how the Internet is” don’t get it, that it shouldn’t be that way and that it has to change. This is a story that will definitely continue to be in the news, and hopefully it will start to turn around. The other lovely bit of news that happened this past weekend was a group decided it would be prudent to attack the PSN with a DDoS attack. For the uninformed, a DDoS attack essentially is a huge number of false attempts to access a network, which ultimately overwhelms the servers and basically results in shutting the service down for a period of time. The apparent reason for the attack was that this group was unhappy with how Sony was using the money they make, as it pertains to the Network. So the best course of action in their mind was to take down the whole network for everyone. It also seems to be that the same group had sent a bomb threat to the airplane that the Sony Online Entertainment President was on. Now that same group has the FBI investigating them, and thanks to their idea of threatening a plane will be investigated as terrorists. Switching gears away from terrible news about horrible people, we’ve finally reached that magical week of the summer. 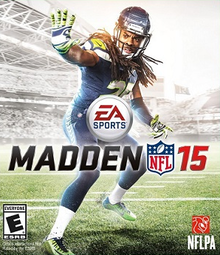 Madden NFL ’15 came out this past Tuesday. While I’m not the biggest sports game fan, the release of Madden every year is a great indicator that the summer down time is over and we’ve reached that magic time of year when new games come out just about every week. We have a down week this coming Tuesday, but after that, it’s Destiny time. The other really awesome bit of news is that this weekend is PAX Prime, and I fully expect to see a few new bits of news come out of the conference. I saw a rumor floating around that we might see a new Saints Row announced at the show, but we’ll have to wait till after the weekend to know for sure. This entry was posted in Weekly News Recap and tagged DDoS, Madden NFL 15, News, Video Games by Dan Fasulo. Bookmark the permalink.